Regardless of which ballistic calculator you choose to employ, the “garbage in, garbage out” mantra applies: The information you get from that app is only as good as the information you give it to work with. Calculations that once took a room filled with computers can now be completed in seconds on your smartphone via a first-rate ballistic calculator. Like so many things in our modern lives, precision shooting solutions have found their way onto our smartphones. Ballistic calculators or “solvers” have evolved and miniaturized from large computers to handheld devices — and now into smartphone apps. But are the phone apps any good? And if they are, what does the average shooter get from spending money to purchase one and investing the time to learn the systems? Accurate muzzle velocity measurements specific to your rifle and your load are critical inputs to enable the calculators to function correctly. The Magneto Speed chronograph mounts to the muzzle, or the suppressor in this case, to measure the velocity of the bullet as it exits the rifle. The good news is that the cost of a smartphone-based ballistic calculator ranges from free to $29.99. For the average shooter, a free app can considerably improve his or her ability to accurately engage targets and, more importantly, learn the consistency and limitations of a rifle and load combination. And because none of them are overly expensive, you can download several and pick one you like best from the crowd. As for investing time, the complex math is handled behind the digital curtain, and the inputs are typically the familiar rolling tumbler interfaces to select settings or blank fields to type in data. But before you go thinking you’re about to become a 1,000-yard long-range ninja, there are a few things to keep in mind about what a ballistic calculator will — or will not — do for you. How will a ballistic calculator help my shooting? Aside from the inherent attraction of knowing how one’s bullet flies through space (we’re gun nerds, after all), a ballistic calculator tells you where your bullet will strike a target at given distances, under pre-defined conditions. The forces of gravity, wind and your cartridge’s load and projectile behave in a mathematically predictable but sometimes non-linear manner as the bullet flies through super-sonic, trans-sonic and sub-sonic speeds. These changes, and the required aiming adjustments along with a vast library of load and projectile data, are the reasons to own a solver. But does all this technology and math matter? It depends. If you’re a whitetail deer hunter who rarely takes shots outside 100 yards in a dense forest, then no — much of this data will not help you. The shorter the distance to the target, the less impact external forces have on a projectile, so your time and money would be better spent practicing good form in multiple shooting positions using a consistent load appropriate to your quarry. If you’re into long-range target shooting as a discipline or hunt in areas where longer shots are ethically more frequent, a solver can be a profoundly useful tool, and you should take the time to master its functions. This diagram shows the “Four Degrees of Freedom” the Hornady 4DOF calculator measures to predict the path of the projectile. Note the “Angle of Attack,” which is the added variable in addition to windage, elevation and range. Like any computer program or math problem, the results are only as good as the inputs. In other words, if you’re using incorrect rifle and load-specific data, the solutions any solver spits out will be equally and sometimes exponentially incorrect. Muzzle Velocity: How fast the bullet is moving when it exits the rifle. Cartridge Load: The caliber, projectile shape and powder charge. Atmospherics: Temperature, altitude, barometric pressure, etc. Muzzle velocity is arguably the most critical input variable in calculating the downrange performance of a particular round. Keep in mind that there are variances in every cartridge created by differences in powder charge, thickness of the brass wall, seating depth and a multitude of other factors. Talk to any handloader and they’ll opine endlessly as to which of these factors matter most and when, but the bottom line is that in both handloaded and factory ammo, variations from one round to the next will inevitably occur. This translates to different speeds at which a projectile exits the rifle’s muzzle, and therefore how far the bullet will travel during a fixed period of time (i.e., 1 second). A good rule-of-thumb is to take the average of at least five rounds. Most shooting ranges will have chronographs for rent or a rangemaster who will chrono your rifle for a fee. I prefer a MagnetoSpeed barrel-mounted chronograph because there is no device to shoot through (as with a chronograph on a stand) or get blown over in the wind, nor do you have to call a range halt to walk a traditional chronograph in front of the firing line. Use your instincts: If the measurements vary wildly, start over and compare the averages of several five-shot groups if necessary. So much of the ballistic math depends on this single data point that it’s worth your time to get as accurate a number as possible. Muzzle velocity is an average, and like many other calculations the solvers will make, some assumptions and rounding will occur, so where you can control the inputs you need to make them as perfect as possible. If you’re not a handloader, use cartridges from the same box and lot whenever possible because factory conditions can vary from day-to-day. Always avoid different brands and bullet weights. What you’re trying to establish is a baseline for a single load (powder charge) in a particular rifle of a specific bullet (full metal jacket, open-tip match, soft-tip hunting round, etc.). Again, there’s a multitude of smaller factors that can affect performance, such as heat and cleanliness of the barrel, but knowing the mass of the projectile flying through the air, and that it’s the same from shot to shot, is critical. Throwing together several projectile weights and brands will give you inconsistent data, skew your results and ultimately waste your time. It’s important to note the factory velocities and bullet drop tables on the side of the box will almost never match your rifle. The box data does not tell you the length of the barrel through which the bullet travelled, the atmospheric conditions when the round was fired or how many shots were tested. It’s an approximation, and one you can use if you must — but where possible, collect the data yourself. For example, the factory might have used a 24-inch barrel to log the velocity data. Your rifle might have a 22-inch barrel, which will likely reflect lower velocity (generally, shorter barrels see a reduced velocity, all else being equal). Inputting the higher velocity number from the box will skew the calculations. It’s also worth noting that some solvers will have functions that allow you to back into a rifle-specific velocity by using the factory numbers and adjusting for barrel length, but this will never be as accurate as data collected yourself. Atmospherics — the external conditions such as temperature, humidity, barometric pressure and altitude — will all affect how a projective flies through space over distance. Some solvers can download real-time weather data into their calculations. This feature is convenient, but keep in mind the data will likely come from the nearest weather station that might be miles away and at a different altitude. The best method is to have a local meter such as a Kestrel 5700 or similar device. If neither of these are available, many public ranges will know the specific altitude of the range and have a thermometer and barometer mounted for the shooters. If you don’t see one, ask the rangemaster or other shooters if they know … someone likely will. Presuming you have a consistent rifle setup with good glass that allows for repeatable adjustments that reflect the windage and elevation adjustments the ballistic calculator will derive, here are a few apps to consider. Given that several are free, download them all and compare the results and ease of use and use the one you prefer. I’ve used all of the listed calculators to a greater or lesser degree, and each has performed consistently. How each solver uniquely calculates trajectory is beyond the scope of this piece, but these are all solid options, and each allows for “trueing” a rifle to create ballistics tables to adjust for how a round performs in a particular rifle vs. how the math says it should. Hornady went back to the drawing board and used Doppler radar to measure (in addition to the standard windage, elevation and range inputs) bullet trajectories to include a fourth factor: the angle of attack. This method takes into account the angle of the bullet’s launch from horizontal, which can have an impact on its flight. Hornady also departed from the traditional ballistic coefficient (BC) measurement of the efficiency with which a bullet flies through the air, and instead they used a drag coefficient (CD) vs. Mach value. Hornady feels this system reflects a more accurate representation of a bullet’s flight, but the program can also utilize BC values to calculate tables for projectiles upon which they have not collected data. It can also communicate via Bluetooth with other external devices. The Shooter app’s greatest strength is its simplicity. It’s simple, fast and easy to use. In addition to having a built-in library of more than 1,300 bullets, it also has G7 BC data collected by engineer and ballistician Bryan Litz, and it can interface with atmospheric data collected by Bluetooth enabled Kestrel devices. Lapua Ballistics took the four degrees of freedom and Doppler radar concept two steps further and added the impact of the rotational movement on the elevation and range axis to derive an even more precise prediction of a bullet’s flight over time and through space. The only drawback of this system is it only includes Lapua’s projectiles. 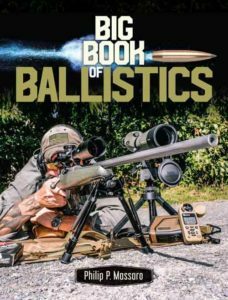 JBM’s Ballistic Calculator includes a library of more than 5,000 projectiles and factory loads, as well as an MOA and mil-dot rangefinder based upon a known target size. Written by James B. Millard, the Ballistic computing engine allows multiple scenario wind calculations and includes G7 BC data as well as the ability to specify your own projectile properties. The “M” version of BulletFlight is the most expensive offering in the Runaway Technologies line, but it has been designed with Knight’s Armament for military applications and includes ballistic tables for specific issue rifle and ammunitions setups, such as the KAC M110 with M118LR ammunition. BulletFlight M also features an internal accelerometer that calculates the angle to the target if the phone is mounted perpendicular to the rifle’s bore.